What’s left of Carbide Willson’s fertilizer plant. So the story behind the ruins, is that Tomas Leopold Willson first settled down in the forest in 1907 to study his fertilizers. The spot he picked was good for many reasons, as it was consider the ideal spot for is one of his most "daring" experiments. Within the walls, we now consider ruins, he produced phosphate fertilizer which was made from condensed phosphoric acid. He developed a method for the production of calcium carbide, in which earned his nickname "Carbide." The substance is harmless when dry, but will produce an extremely flammable gas when dampened called acetylene. Willson’s fertilizer plant included an acid condenser tower, dam, footbridge, and generator station which was built on Meech Creek. So, if you are in the area and would like to check out the ruins yourself, start by going to Gatineau Park. Follow your way to Meech lake until you reach P11 (O'Brian Parking lot). You're going to follow trail 36 for about a 20 minute walk. You'll pass over a bridge, and following the trail until you come to a path on the right (5 minutes from the bridge), and then follow the trail until you reach the mill. I'm not sure why, but whenever I decide to explore Gatineau, it is always a rainy/foggy day. Which I am totally not against when it come to fog because it can make for some stellar photos, but rain on the other hand doesn't exactly go well with my camera. My buddy Jess got the muddy end of the stick, while out and about. 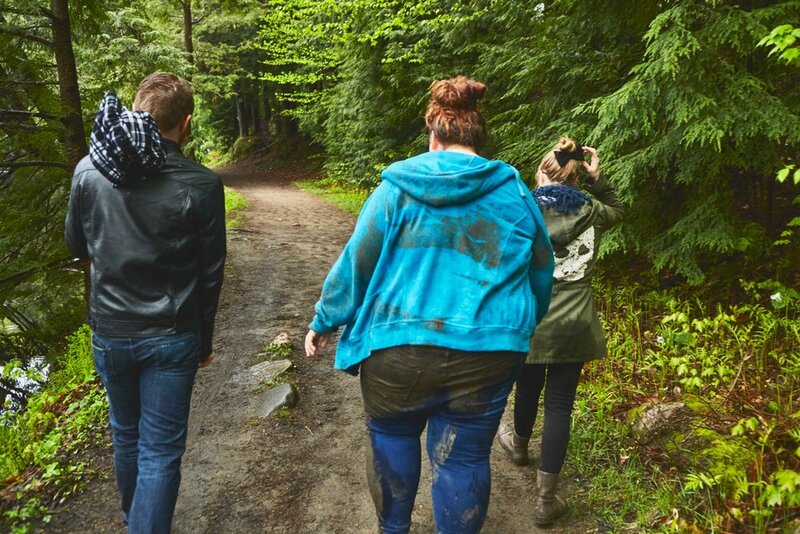 She ended up falling not once, nor twice, but four times in the mud. On the plus side, she looked like she was rocking Nordstroms $425 "mud pants" but the only 1/10 of the price. Below is the complete collection of my day out with Jessica, Emilie, and Connor at Gatineau Park! And of course, a short video!